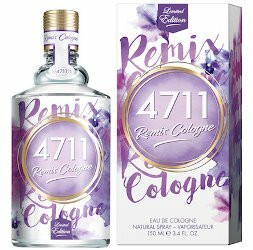 4711 has launched Remix Cologne Edition 2019, the second in the brand's series of note-specific limited edition variations on 4711 (see: 2017's 4711 Remix Cologne and 2018's 4711 Remix Cologne Edition 2018). 2018 focused on orange; 2019 focuses on lavender, and was inspired by "van life". Other notes for the modern floriental include bergamot, lemon, mate tea, freesia, hibiscus seed, iris, sandalwood, praline and musk. 4711 Remix Cologne Edition 2019 is available in 100 and 150 ml Eau de Cologne. I’m going to admit to being the only person ever to not like 4711. These remixes though, sound pretty good. hey lillyjo, the 4711 flankers can be really interesting. I love 4711 so it was easy for me to buy a lavender-centric one, plus it was a huge bottle for very little money. I wish there was an easy way to sample them, tho that might mean I’d have enough 4711 I could bathe in it every day, hahaha! Years ago, I worked in a place that sold 4711 and we could not keep it in stock! It sold like crazy. These new remixes have really caught my attention. Do you have stores that carry them where you live? I haven’t seen them here. Ha – I didn’t see your comment before I posted. Deva’s van life might work for inspiration! Lol, I’m assuming “van life” must mean something different than it does to me (soccer moms), must refer to holidays and caravans in Europe maybe? Yeah, no, it means young people (mostly) living it free and easy in vans. Google “van life”, you’ll see. Oh, got it. Well, I guess I’m not the target audience – not hip enough! I’m sure I’m not either!